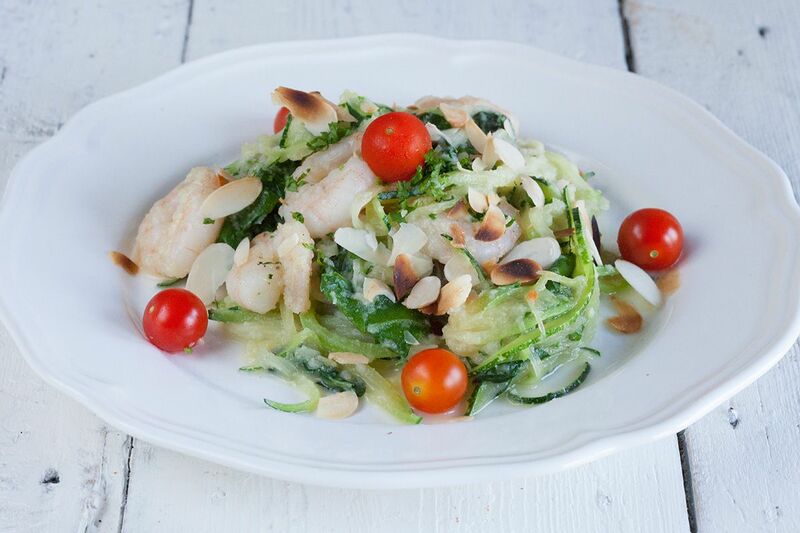 Looking for an amazing dairy and gluten-free recipe? 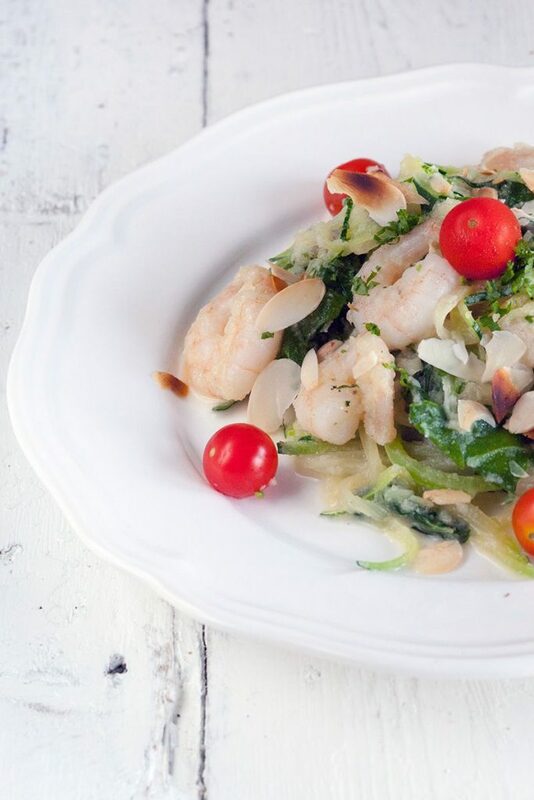 You should definitely try this zucchini spaghetti with shrimps and creamy cauliflower! 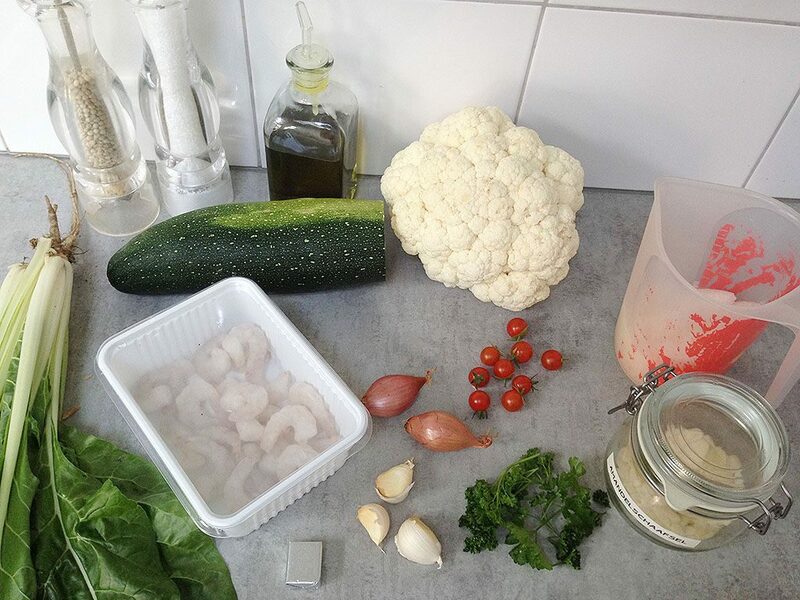 Start with the roasted cauliflower puree by following our recipe here. PEEL and roughly chop the garlic clove and set aside. 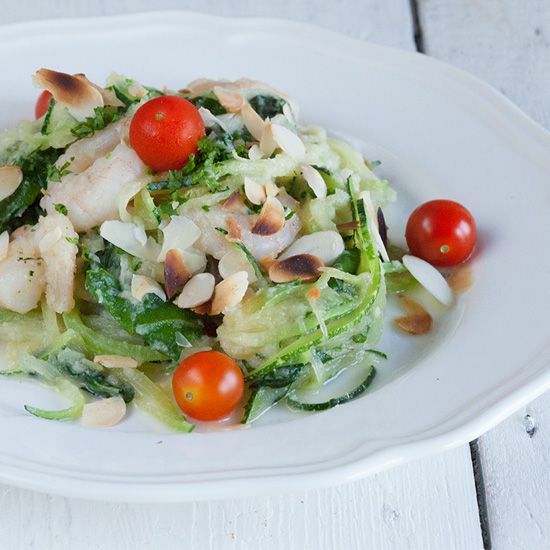 Use the spiralizer to create lovely zucchini spaghetti. If you don’t have a spiralizer, you can also use a chef’s knife to slice the zucchini into thin strips. CLEAN and defrost the shrimps if necessary. RINSE the swiss chard, use a salad spinner to get rid of any excess water and chop it roughly. HEAT the large skillet without adding any oil or butter. ROAST the almond shavings for a few minutes, a little bit dark is okay but keep an eye on them cause they will burn very quickly. TRANSFER them to a small bowl and set aside. HEAT olive oil in the large skillet along with the roughly chopped garlic clove and let it simmer on low heat for a few minutes to create a lovely garlic oil. REMOVE the garlic pieces from the oil and ADD the shrimps. After about one minute also ADD the zucchini spaghetti. COOK it all together until the zucchini starts to soften, then ADD the chopped swiss chard, vegetable stock cube and roasted cauliflower puree. COOK until the zucchini and swiss chard are done and ADD the cherry tomatoes for the last few minutes. SEASON with pepper and salt and serve with the roasted almond shavings and chopped parsley. Enjoy!